The overall pool of League players has remained steady since 2008 but is some 20% below the peak years of 2005 and 2006. FOG accounted for 79% of the player registrations in 2010, up from 54% in 2009 and effectively winning the rules war in the Northern League. Either the number of DBMM players declined in 2010 on the previous year or 2009 was an exceptional year for DBMM: take your pick. 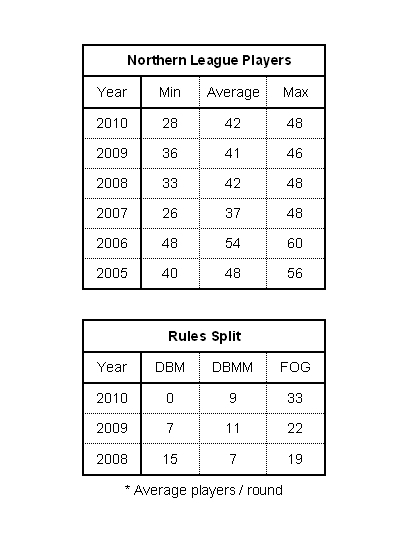 The 2010 rules split confirms the status of DBMM as a niche rule set; at least in the Northern League. After a slow decline there’s no longer any demand for DBM in the north of England. It’s tempting to say that in the 2010 all the former DBM players switched to FOG but the situation isn’t that straightforward: some did some didn’t. Do bear in mind that the FOG games are nearly all doubles games (so 16 teams in 8 games on average) whereas the DBMM games are mostly singles (so 8 teams in 4 games on average). I hope to follow this with an analysis of some of the bigger 2010 national competitions once the full results have been posted online. The analysis of last year’s figures is here.